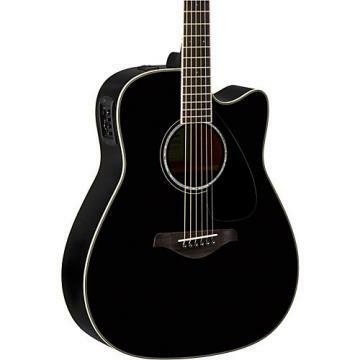 Derived from the FG830 which has a solid spruce top and rosewood back/sides, the FGX830C has a cutaway body and the electric system. 's proprietary under-saddle piezo pickup and System66 analog preamp ensure the solid plugged-in performance. Scalloped BracingThis FG has louder and stronger sound in the low- to mid-ranges, thanks to cutting-edge acoustic analysis technology developed by the R&D Division. ’s engineers have achieved this sound by utilizing analysis and simulation to arrive at the best bracing design without depending on tradition or guesswork. This analysis led to the development of a new scalloped bracing pattern, a new and ideal acoustic structure that maintains the durability of the top board while bringing out the most sound the FG has to offer. System66 Preamp/Pickup SystemSystem 66 feature an under-saddle piezo pickup developed by . Controls include a 3-band EQ, an adjustable mid-range frequency control, and a precision chromatic tuner for optimum sound tailoring. The system is powered by easy to obtain AA-size batteries that provide a stable power supply for improved sound quality.